Red-flowering Currant (Ribes sanguineum) – Ignites loving power and compassion in yourself to joyfully transform what you most fear into feeling safe, protected and full of Light. Encourages forgiveness and understanding that this transformational process is in alignment with your soul’s purpose. I AM loving power to transform in yourself that which you most fear. Red-flowering currant is a North American Pacific Northwest native deciduous perennial shrub that grows to 10 feet and produces profuse blooms of reddish-pink blossoms in early spring. The flower nectar is an excellent food source for hummingbirds and the dark purple berries are a favorite for wildlife, and are edible but not tasty to humans. Unable to acknowledge, release and move past deep-seated fear. Lack of joy from being caught in fear. First response to change and new experiences is fear. Red-flowering Currant Flower Essence brings to awareness deep known and unknown fear, engenders forgiveness and compassion for yourself and whatever is triggering the fear response, then transforms the fear into feeling safe, protected and full of Light. It encourages you to joyfully and confidently engage life from the understanding that this transformative process is in alignment with your soul’s purpose. 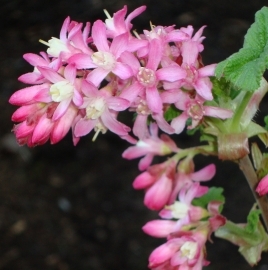 Red-flowering Currant Flower Essence was made by the no-pick method of working directly with the plant spirit. While the essence was being made a matrix of Amber, Amethyst, Angelite, Drusy Quartz, Icosahedron Cut Quartz, Pink Sapphire, Rhodochrosite and White Moonstone crystals were placed among the trees with the mother bottles. The sun acts as a transformer to step down spiritual energies from higher dimensions. While the essence was being made, Amber acted as a lens to receive and focus sunlight for this purpose. Amethyst brings peace and contentment. It enhances clear communication between your mental, physical and emotional bodies and between the physical and spiritual worlds, while translating those communications into daily activities. Angelite is a stone of tranquility that invokes inner peace. It connects you with your angels and spiritually aligned guides. Drusy Quartz crystals help to energize and stabilize your subtle bodies. Icosahedron cut quartz has 20 (5X4) equilateral sides. It is a bridge between the 5th Dimension - the entry into the unified Spiritual realms - and the 4 cardinal directions (N, S, E, W) on Earth. Jeffrey Quartz provides strong amplification properties and long distance healing abilities. Pink Sapphire opens your heart to the joy of interacting with kindness, forgiveness and love. Encourages vulnerability with appropriate boundaries. Rhodochrosite instills a courageous heart; it gently aids with healing past wounds, rediscovering self-love and embracing joy. White Moonstone instills calmness and awareness. It helps you to sort your emotions to see how they serve your higher purpose.